This latest batch of commissioned drawings is for a client who has been having me draw DC's "Golden Age" (or "Earth Two" if you're a comic geek like me) Justice Society of America characters. 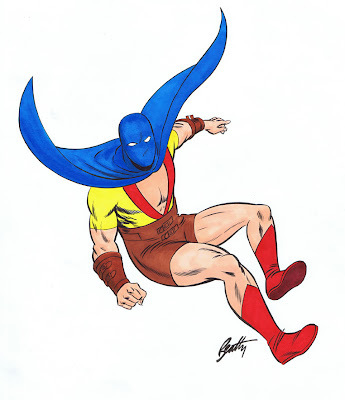 Rounding out the collection, we have Hawkman, Wildcat, Mr. 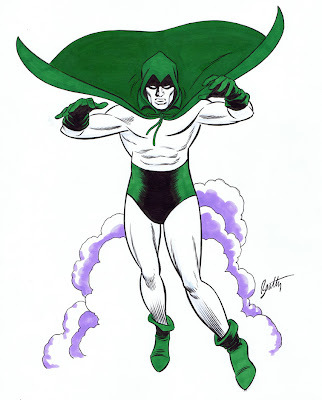 Terrific, The Spectre and the Atom. These were fun to draw, as I've always had a fondness for this crew -- having been introduced to them when they made their annual guest appearances in the 1960s Justice League of America comic book. As of tonight, this brings me up to date with current commission orders. If no more orders come in in the next few days, I may be drawing some characters of my own choosing and putting them up for grabs on eBay. I'm having too much fun doing this to stop right now....! The champion of fair play never looked so good. 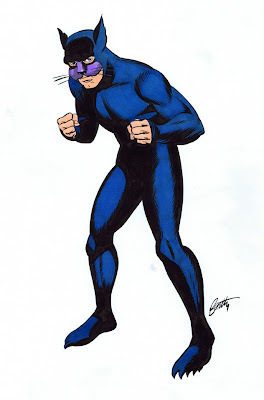 And Wildcat looks poised to whoop someone, as always. Love the Golden Age JSA, I wrote my 10-page final paper about them for Diana Green's Comic History class my sophomore year. My favorite member? 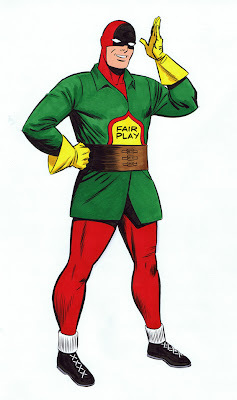 The Alan Scott Green Lantern. His costume is amazing, perfect colors. Then comes Sandman, gotta love the gas mask, suit, and fedora. Your treatment of him is spot on, they all are. Great stuff to look at! Thanks for posting it! Terry! Amazing work! I'll visit often. In an age of comics where ultra realism and hyper detail reign supreme, yours is a classic style, refreshing and considerably more appropriate for escapist reading. Bravo. 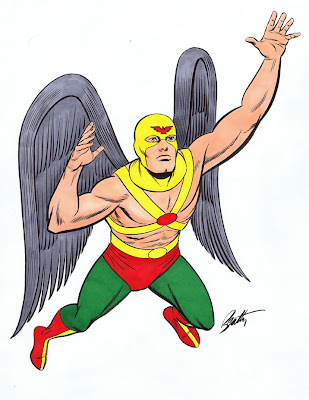 Produce a creator-owned title and I will definitely be there with bells on (or start drawing JSA).